Quincy Butler is an American football cornerback, currently playing for the St. Louis Rams of the National Football League. Acquired by St. Louis via waivers from Dallas (12/8/08)…signed to the active roster by Dallas from the New Orleans practice squad (10/30/08)…signed to the practice squad by New Orleans (10/18/08)…re-signed as a free agent by Dallas (1/16/08)…signed to the practice squad by Dallas (9/4/07)…signed to the active roster from the practice squad by Dallas (12/24/06)…signed as an undrafted rookie free agent by Dallas (5/2/06). PRO: Has played in two career games…since entering the NFL in 2006, has spent time on the Dallas active roster and practice squad, on the New Orleans Saints practice squad and on the Rams active roster…also spent time in 2008 with the Calgary Stampeders of the Canadian Football League. 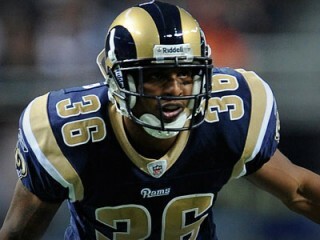 2008 SEASON: Played in one game for the Rams…inactive for two other contests…joined the Rams via waivers from Dallas (12/8)...inactive for four games with the Cowboys…joined the Cowboys (10/30) from the New Orleans practice squad where he spent two weeks…signed to the New Orleans practice squad (10/18)…also spent time with the CFL’s Calgary Stampeders. 2007 SEASON: Spent the entire season as a member of the Dallas practice squad. 2006 SEASON: Began the season on the Dallas practice squad before being added to the Cowboys active roster (12/24)...played in one game and was inactive for one regular season game and for postseason contest at Seattle (1/6/07)…vs. Philadelphia (12/25): Made NFL debut on special teams. First-team All-Mountain West Conference selection at cornerback as a senior at Texas Christian...selected to play in the East-West Shrine Game…tallied a team-high five interceptions, all in October, as a senior…arrived at TCU as a junior after two seasons at Tyler Junior College…at Tyler Junior College, was a two-time selection to the Southwest Junior College Football Conference All-League team…recorded 151 tackles and eight interceptions, one for a touchdown, in two seasons at Tyler J.C…ran the 400-meters and 4x400-meter relay for the TCU track team…earned All-America honors…majored in communications with a minor in criminal justice. First-team All-District selection at quarterback as a junior and senior at Roosevelt High in San Antonio, Texas. View the full website biography of Quincy Butler.